Joe Mongelli is a trumpet/flugelhorn player based in the Cape Cod area. He leads a group of regularly gigging and swinging musicians he calls The Cape Jazz Crew. The Crew consist of: Fred Boyle: piano, Ron Ormsby: bass, Steve Langone: drums (except tracks 3, 4, 8), Bart Weisman: drums (tracks 4 & 8), Alan Clinger: guitar (track 6) and Bruce Abbott: flute (track 4). Together they have released an album entitled, WashAshore. With ten tracks of well-known standards, Mongelli’s arrangements are at the heart of the compositional interest. His arrangements are smart, lyrical and inspire improvisation by his talented band members. There’s something thoughtful and magical about a regularly gigging band; WashAshore is a prime example of that magic. “I Got It Bad” is given a great new arrangement, with the swiftly moving drums of Langone pushing the energy ahead on this relaxed Latin pulsed selection. Mongelli’s tone is warm and round and he plays in a very relaxed manner, taking care to construct each phrase in the most musical manner possible. When Boyle solos on piano, the beauty of the arrangement can really be heard. Mongelli’s solo is a study in relaxed and fluid ferocity. I enjoyed “Watermelon Man.” an arrangement with shades of funk peeking through this unforgettable Hancock melody. Mongelli is impressive with his melodic skills, adding slides and doits in all the right places. His solo is right from the classic blue note period, swinging and melodic. The band does a superb job of laying out the feel, the chemistry between them is evident. Mongelli has been developing his arrangements and approach with the Cape Jazz Crew through years of gigging together. With Mongelli’s talents on trumpet and flugelhorn and the band talents with swinging interaction, the result yields an outstanding small group performance. 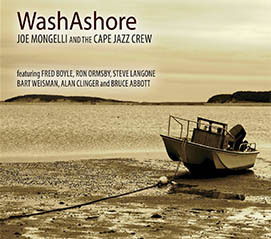 This is an artist to keep an eye on and an ear on, expect to be impressed with Joe Mongelli and the Cape Jazz Crew.